Welcome to the Dance on Us Online Studio Booking System. Through our improved Online booking system, Hirers can now book Dance On Us studios directly. It is fast, secure, easy to use and free of cost with multiple advantages. Following are the simple steps to be followed for an online booking. Any valid Dance on Us Hirers are eligible to check the studio availabilities, and proceed to make an online booking at his/her convenience. A onetime registration with Dance On Us is a must for all Online studio Bookings. The basic information about the Hirer with a valid e-mail identification and Phone number is mandatory for user registration. All first time users have to provide a valid, unique userid at the time of registration. Users can set their Passwords at the time of registration. A confirmation e-mail will be sent to the provided e-mail address, and on successful authentication; the account will be activated and ready for an online booking. Once the User gets registered, he/she can directly go to the Studio booking process using the valid login credentials. A valid logged in user will get some additional links in his page header for direct navigation to his Shopping Cart, links like Quick Booking, My Account, My Bookings and Logout. 3. Clicking on the Available Time Slots displayed on the Day View Calendar view of any studio. Select the Type of Booking : Choose requested booking is for a Single studio Booking or a Repeated Booking for a time block ? * For a Single Booking, the user needs to provide the Start Time, End Time and the Date of Booking and then continue the process. * If the selection is for a Repeat Booking, additional information like booking Frequency, Start Time, End Time, Start Date and End Date for the booking needs to be provided. Once the required parameters are filled, users can click on the Populate or Search for Available Studios button which will search the list of studios that are available for booking for the selected criteria. Users can Select the required studio from the list and click on Submit. The Booking summary page gives an overview of the selections made by the user and allows user to either continue his booking by clicking on “Add to Cart” button or even Cancel the selection made and go back to the previous booking page for any booking modifications. Add to Cart button on the previous step will navigate users to view their shopping cart, where he/she can add another bookings, or remove few of the items from the cart. Once the bookings are added to the cart, users can continue further by clicking on the “Continue Payment” button. ** Important Note: Please be informed that all the blocked bookings including bookings added in to CART also will get deleted automatically if it is kept unattended for more than 15 minutes. This means a maximum blocking time for any incomplete bookings are restricted to a time frame of 15 minutes from the time of blocking. After that the blocked slots will be freed automatically and will be made available for other users to select their booking. Clicking on Continue to Payment button in the previous page, the application will navigate him to the Payment page, where user will have the flexibility to select one of the allowed Payment Methods and then process the payment. In this page users have the choice to add any order comments and then Review & Continue the booking for final processing or go back to the previous steps to make some modifications. This page will give a final summary on the bookings made. On verification of the final order, users can either submit the order by clicking on the “Submit order” button or go back to the previous payment page by clicking on the “Back to Payment” button. Submitting the order in the previous page will process the final order and yours will get a final confirmation number with the New Hire Invoice Number generated for all future communications related to this Booking. Note : If the payment method selection is for PayPal payment, the application will navigate the user to the external, secured payment gateway provided by PayPal. Users need to provide the necessary details requested by the PayPal website and follow the instructions to make the Payment success full. On successful payment, users will be notified through the Dance on us Website as well as through their registered e-mail address. Once the order gets confirmed, logged in users can track their booking Statuses and make cancellation requests etc. ; using the “My Bookings” links available on the submenu provided under the Header area. You can reach us on e-mail through at admin@danceonus.com or enquiries@danceonus.com or through phone at 6737-4466 or 966-00093 for more information. Whenever a user click on Register, the following input form will be populated and will ask for the basic mandatory information related to the user. 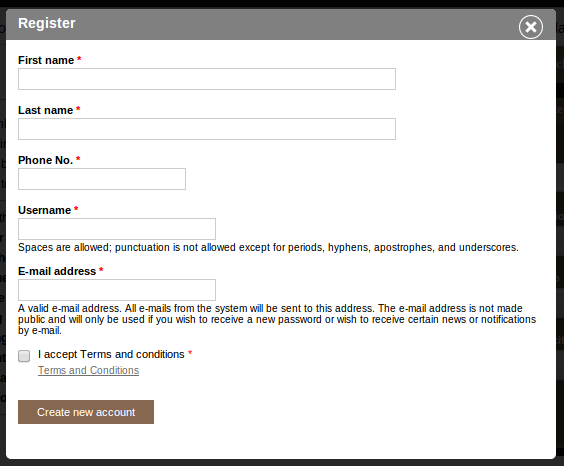 User need to accept the Terms and conditions to continue further and then submit the form by clicking on the "Create New Account" Button. On submission an e-mail will be fired to the registered e-mail id and the following message will be displayed on the screen after successfull submission. User(s) will receive an e-mail from Dance on Us Admin Team, which includes a link to activate the account by either clicking on the link or copying and pasting the link url in any browser window to open the page. This link can only be used once to log in for the first time and this will lead the user automatically to a page where users can set their login password for their account. 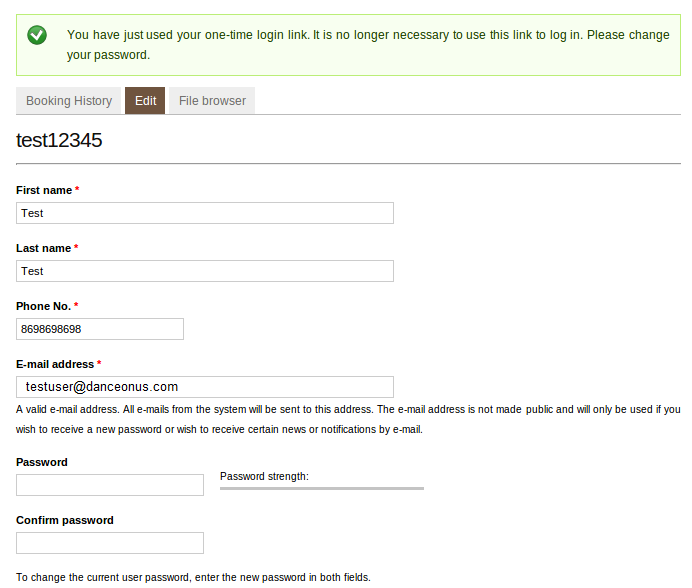 Users will be navigated to the following page where he/she can set their password for the first time for their future logins. Once the password is set, user(s) can log in to the website anytime and make their online bookings whenever they want at their convenience.